"Among scientists are: collectors, classifiers, and compulsive tidiers-up." Catalogues of Simple Perfect Squared Squares (SPSSs). Pdfs, Bouwkampcodes & tablecodes. Catalogues of Simple Imperfect Squared Squares (SISSs). Pdfs, Bouwkampcodes & tablecodes. Catalogues of Compound Perfect Squared Squares (CPSSs). Pdfs, Bouwkampcodes & tablecodes. Stuart Anderson, Compound Perfect Squared Squares of the Order Twenties(Pdf) P. J. Federico used the term low-order for perfect squared squares with at most 28 squares in their dissection. In 2010 low-order compound perfect squared squares (CPSSs) were completely enumerated. Up to symmetries of the square and its squared subrectangles there are 208 low-order CPSSs in orders 24 to 28. In 2012 the CPSSs of order 29 were completely enumerated, giving a total of 620 CPSSs up to order 29. Lorenz Milla, Smallest Squared Squares(Pdf) In this paper we have a look at squared squares with small integer sidelengths, where the only restriction is that any two subsquares of the same size are not allowed to share a full border. We prove that there are exactly two such squared squares (and their mirrored versions) up to and including size 17x17. They are shown in Figure 1 (page 2). Squared rectangles and squared squares are often represented in a concise form known as Bouwkamp code (or Bouwkampcode), named after C.J. Bouwkamp who invented this notation and popularised its use. 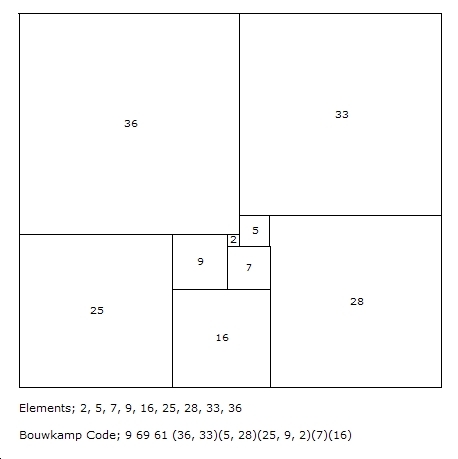 Bouwkamp code consists of a string of numbers giving firstly the number of squares in the dissection (called the Order), the width and height of the square dissection, where width >= height, and finally the sizes of the squares of the tiling, often called the elements, as integers e1, e2, e3, ... en (with or without parentheses or commas), which are arranged from left to right and then top to bottom in quite an extensive method of identification. In the published literature parentheses and commas are used to group consecutive squares in a horizontal row and the groups are in order of decreasing height. The Bouwkamp code parentheses are not required to reconstruct the tiling but they make it easier to sketch a tiling by hand and all published literature uses them. Bouwkamp code without parentheses and commas has been named tablecode and introduced by J.D. Skinner. It is simpler and shorter. The Bouwkampcode and tablecode for the 69 x 61 Squared Rectangle figure above is 9 69 61 (36,33)(5,28)(25,9,2)(7)(16) and 9 69 61 36 33 5 28 25 9 2 7 16. Tablecode, Bouwkampcode and Bouwkamp code are used interchangeably in this site. There are several additional fields which are sometimes included in the Bouwkampcode, we can call these codes Extended Bouwkampcode ; In datafiles from this site the additional fields are included after the main Bouwkampcode. An asterix * is used to divide the Bouwkampcode fields from the additional fields. These additional fields are used for captions, ie placing information such as the tiling id, discoverer, isomer number, year of discovery underneath the tiling in illustrations in webpages such as those on this site or in the production of postscript images of squared squares. The order, height and width are usually the first three fields, but are not always included in the main Bouwkampcode itself, as they are not parenthesised, but are often included in the extra fields. The initials of the author/discoverer (3 uppercase alpha characters) eg , AJW, CJB, JDS. SISS are currently unnamed but could also be given a unique ID, some combination of size and an alphanumeric string. Rotations and reflections of a square tiling may create different Bouwkamp codes. Canonical Bouwkamp code is the unique code which is the highest Bouwkamp code, the one that is numerically largest (comparing elements going left to right) from the Bouwkamp codes of all possible rotated and reflected versions of that square tiling. If squared rectangles and squared squares are put into canonical Bouwkamp code form, duplicates of existing tilings can easily be identified, new discoveries can be verified and complete catalogues for many low order tilings can be made in a compact text form, suitable for computer data processing, document production, browser viewing and computer graphics rendering. For SPSRs the canonical Bouwkamp code is also the one corresponding to the dissection in landscape orientation where the largest corner element is in the top left corner and is listed first out of the elements. This is easy to check. For SPSSs only the first two elements need to be examined for highest Bouwkamp code, that is the largest corner square in the top left corner and largest boundary square adjacent to it, which goes on its right. These two elements are the first and the second listed elements in the canonical Bouwkamp code. For Imperfect tilings (SISSs, SISRs) it may be necessary to examine all elements in the Bouwkamp code to determine the canonical highest Bouwkamp code. We refer to different squared squares with the same elements as isomers. The smallest order for SPSS isomers is 25 for pairs and 28 for triples. By definition a CPSS is one of at least four isomers. A CPSS is one of up to 8 isomers in order 25, 16 isomers in orders 26 and 27, and 48 isomers in order 28. The Sprague square of order 55 is one of 12,582,912 isomers! For every order there is a CPSS catalogue with only a representative CPSS for each set of isomers. For the lowest orders there are also catalogues which include all the isomers. Unfortunately many CPSS in the published literature are not recorded in any discernably consistent canonical Bouwkamp code representation. The CPSS canonical representative on this website is the CPSS isomer with the 'highest Bouwkampcode' (by element values, not lexicographically). J.D. Skinner has supplied the following listing and tablecode for squared squares from orders 21 to order 30. This file has not been updated since 2003..
biglist.zip(41k) has a listing of the squared squares by order, size/id and type (SIMP/COMP) - the size/id is different from the system used on this website, it is a concatenation of the size and an uppercase alpha character(s) where ALL perfect squared squares of a given order (both SPSS and PSS) are indexed. The size/id in biglist.zip is used to refer to the corresponding Bouwkamp code in the 00table.zip file. Discoverers initials are included. 00table.zip(558k) contains the corresponding Bouwkamp codes (in tablecode form). David Moews has an explanation and an example of the use of Bouwkamp code. The AMS has provided a free download of Duijvestijn's paper on Order 26 simple perfect squared squares (SPSSs) and 2x1 simple perfect squared rectangles (SPSRs). Copies have been supplied of the missing Bouwkamp codes TableI Order 26 SPSSs and TableII Order 26 2x1 SPSRs which originally accompanied the paper. (1) CPSSs tablecode Order 24 by discoverer. (4) CPSSs Order 24 isomer tablecodes. (2) CPSSs tablecode Order 25 by discoverer. (12) CPSSs Order 25 isomer tablecodes. (16) CPSSs tablecode Order 26 by discoverer. (100) CPSSs Order 26 isomer tablecodes. (46) CPSSs tablecode Order 27 by discoverer. (220) CPSSs Order 27 isomer tablecodes. (143) CPSSs tablecode Order 28 by discoverer. (948) CPSSs Order 28 isomer tablecodes. (412) CPSSs tablecode Order 29 by discoverer. (2308) CPSSs Order 29 isomer tablecodes. (941) CPSSs tablecode Order 30 by discoverer. (5668) CPSSs Order 30 isomer tablecodes. (2788) CPSSs tablecode Order 31 by discoverer. (17351) CPSSs Order 31 isomer tablecodes. (7941) CPSSs tablecode Order 32 by discoverer. (52196) CPSSs Order 32 isomer tablecodes. (22413) CPSSs tablecode Order 33 by discoverer, (txt zipped 1.2M). Order 33 CPSS Isomers (150669) can be produced from the CPSS tablecode file with Jim Williams find_basic_isomers program. * Proof of completeness is subject to proof of some conjectures used in the enumeration process. The results for orders 24 to 32 are identical to the previous results for these orders. (62273) CPSSs tablecode Order 34 by discoverer, (txt zipped 3.5M). Order 34 CPSS Isomers (429458) can be produced from the CPSS tablecode file. (172330) CPSSs tablecode Order 35 by discoverer, (txt zipped 10.2M). Order 35 CPSS Isomers (1206181) can be produced from the CPSS tablecode file. (466508) CPSSs tablecode Order 36 by discoverer, (txt zipped 28.9M). Order 36 CPSS Isomers (3337989) can be produced from the CPSS tablecode file. CPSSs tablecode Order 37 by discoverer, (txt zipped 76M). Order 37 CPSS Isomers (8961794) can be produced from the CPSS tablecode file. CPSSs tablecode Order 38 by discoverer, (txt zipped 206M). Order 38 CPSS Isomers (23989218) can be produced from the CPSS tablecode file. CPSSs tablecode Order 39 by discoverer, (txt zipped 564M). Order 39 CPSS Isomers (62894424) can be produced from the CPSS tablecode file. CPSSs tablecode Order 40 (discoverer). CPSSs tablecode Order 41 (discoverer). CPSSs tablecode Order 42 (discoverer). CPSSs tablecode Order 43 (discoverer). CPSSs tablecode Order 44 (discoverer). CPSSs tablecode Order 45 (discoverer). CPSSs tablecode Order 46 (discoverer). CPSSs tablecode Order 47 (discoverer). CPSSs tablecode Order 48 (discoverer). CPSSs tablecode Order 49 (discoverer). CPSSs tablecode Order 50 (discoverer). CPSSs tablecode Order 51 (discoverer). CPSSs tablecode Order 52 (discoverer). CPSSs tablecode Order 53 (discoverer). CPSSs tablecode Order 54 (discoverer). CPSSs tablecode Order 55 (discoverer). CPSSs tablecode Order 56 (discoverer). CPSSs tablecode Order 57 (discoverer). CPSSs tablecode Order 58 (discoverer). CPSSs tablecode Order 59 (discoverer). CPSSs tablecode Order 60 (discoverer). CPSSs tablecode Order 61 (discoverer). CPSSs tablecode Order 62 (discoverer). CPSSs tablecode Order 63 (discoverer). CPSSs tablecode Order 64 (discoverer). CPSSs tablecode Order 65 (discoverer). CPSSs tablecode Order 68 (discoverer). CPSSs tablecode Order 69 (discoverer). CPSSs tablecode Order 70 (discoverer). CPSSs tablecode Order 71 (discoverer). CPSSs tablecode Order 76 (discoverer). CPSSs tablecode Order 79 (discoverer). CPSSs tablecode Order 81 (discoverer). CPSSs tablecode Order 86 (discoverer). Simple Imperfect Squared Squares, (SISSs) Orders 13+. Pdfs, Bouwkampcodes & tablecodes. to illustrate the algorithm and usage of the other scripts and programs. need a higher level of parallelization. This is a simple script that builds all C++ programs. Edit this file to change compile options. compatible with plantri. Each output line (written to stdout) contains one graphs. Format looks like this. listed in order separated by commas and contains a list of the connecting nodes in clockwise order. with less than or equal to that number of edges, and which meet the other requirements, are output. for SPSS, then this should be set to 3. Usually set to 2 for most other uses. "max_edges-1" then the graph is output only if the determinant is either divisible by 13 or divisible by 21. This filter should be used when generating perfect rectangles that can be paired with APS to form CPSS. corresponding to specified parameters is divided into a number of pieces with the number equal to "modulus". Only the piece designated by "residue" is printed. "residue" should range from zero to "modulus" minus one. Changes the mod threshold to <mod_threshold>. If not specified, then mod_threshold will default to 25.
values of "res". The default value, 25, seems like a good compromise that usually works well. if any perfect rectangles can be constructed from the graph and prints the Bouwkamp codes for the rectangles. If this option is given, only squares will be printed. Use this to search for perfect squares. is equal to the full width or height of the original rectangle. This process may be iterated. combined order of the rectangle and the APS is less than or equal to "max_cpss_order". where the aspect ratio is width divided by height. the rectangle may be a square and may be the same size as one of the other squares. the lexically largest one, comparing each number of its output code in succession. of each isomer is printed. Default behavior is to print only the preferred isomer. Causes the output to be Bouwkamp code. Default is table code. Prints an isomer count at the end of each output line. Prints all rotations and reflections. Default behavior is to print only preferred orientation. Simple script that compiles all the C++ programs. Accepts as standard input a list of APS. Output is a filter file in the format to be used by "findpr". Accepts as standard input a list of PRs. Output is a filter file in the format to be used by "findaps". This scripts accepts as standard input a list of PRs and APSes and sorts them by aspect ratio. The output of this script is what is required by "find_candidate_pairs.scr"
and for APS it is the width divide by height of the embedded rectangle. same aspect ratio. Each line of output contains one such pair, with "##" as the separator. This script accepts as standard input a list of pairs as generated by "find_candidate_pairs.scr"
if it needs to be rotated 90 degress. The algorithm behind Jim Williams algorithm is explained in full here. "The basic idea is to take the electrical network associated with a square and split it roughly in half by cutting exactly three nodes. This seems to be possible for most (but not all) low order squares, and probably close to half of squares up to order 33. The outer loops create a large library of “half networks” and the inner loop attempts to pair up two halves to form a perfect square." MANDRILL; Lorenz Milla, and Stuart Anderson's modified plantri with plugin and squared square finders (mandrill-plugin.c & plantrimod.c), Bouwkampcoder (sqt-mod7) and compound/simple Bouwkampcode classifier (bk2cs4). Stuart Anderson's sqfree, sqfind and sqt were rewritten and optimised by Lorenz Milla. Lorenz replaced the Boost library with C arrays and handwritten linear algebra routines; LU decomposition was replaced with LDL decomposition (planar maps are symmetrical, so LDL Cholesky decomposition is possible and twice as fast as LU decomposition). Lorenz adapted McKay and Brinkmann's plantri (modified as plantrimod.c) to filter graphs using the determinant factorisation technique as they were produced, he was also able to speed up the routines in Stuart's sqfind and sqt programs, and write a plantri plugin (mandrill-plugin.c) which incorporated sqfind and sqfree. 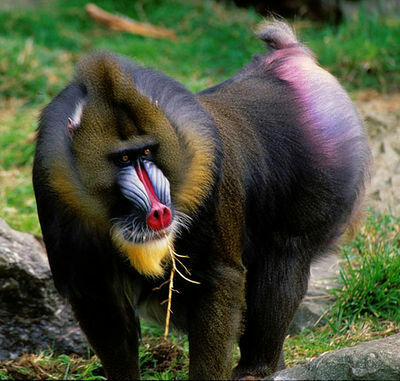 Mandrill is a combination of the names Milla and Anderson. The end result was squared square software 35 times faster than what was used early in 2013. This made it possible to complete the enumeration of order 31 and 32 compound perfect (CPSSs), simple perfect (SPSSs) and simple imperfect squared squares (SISSs) in under 2 months. The theory upon which Kirchhoff matrix determinant factorisation is used to produce squared square candidates, is based on the 1940 paper, "The dissection of rectangles into squares", R. L. Brooks, C. A. B. Smith, A. H. Stone, and W. T. Tutte. In the paper, equations 2.33, 2.34 and theorem 6.12 along with the definition that preceeds it give the theoretical justification. The modified plantri with the mandrill plugin produces graphs which are candidates for squared squares. About 11% of graphs are candidates and only those that have the required determinant factorisation property are produced and saved by the program. Those graphs are then transformed into electrical networks with unit resistances. The currents and voltages of the networks are interpreted as squared tilings and recorded as Bouwkampcodes (in tablecode form) with sqt-mod7. The Bouwkampcoder program sqt-mod7 separates tiling tablecodes into the applicable categories of square/rectangle, imperfect/perfect and compound/simple. It is a recommended that a post-production check be done for compound/simple classification using bk2cs4, or bk2cs, or Armin Singer's findcpss as there are no known cases where sqt-mod7 has incorrectly classified compound or simple squared squares but there is a single known case where sqt-mod7 incorrectly classified a compound imperfect squared rectangle. The sources for mandrill-plugin.c, plantrimod.c, sqt-mod7 and bk2cs4 are available here. // 1. Add this line: #define PLUGIN "mandrill-plugin.c"
// 4. Comment out the lines 18034-18087. // The -lm option is needed to include math.h in linux. // but it counts the other ones too (f < v). // you don't gain any speed if you enter an upper edge bound. // The upper edge bound can also be done by setting the maxorder parameter (see below). sqfree and sqfind operate on plantri planarcode binary files. Both programs find graphs that correspond to squared squares, extract them and save them as extracted files (x_files) in the plantri format. The sqfree program is the faster program of the two, (about 3 times faster) it uses factoring of the Kirchhoff/laplacian graph matrix determinant to find likely graph candidates for squared squares. The output of sqfree, an x_file is then processed by sqfind, creating an x_x_file as output. To convert the x_x_files to squared square Bouwkampcodes, and to filter the Bouwkampcodes into simple, compound, perfect or imperfect, sqt is run on the x_x_files. One could dispense with sqfree, by creating x_files with sqfind, and creating Bouwkampcode/tablecode from the x_files with sqt, but this is a much slower process. Sqt can also be used directly on plantri output, but if finding squared squares from plantri files is the goal, it is much, much faster to search first with sqfree and sqfind. If the aim is to produce squared rectangles, not squared squares, then sqt alone must be used. Compile with g++ for Linux and Mac and MinGW for Windows 7. The Boost C++ ublas library needs to be installed. David Moews homepage also has GPL'd software (written in C) to produce simple perfect squared rectangles (SPSRs). graph.c enumerates all simple perfect squared rectangles with order 20 or below (the order can easily be varied by editing the source). Each rectangle's order, size, and Bouwkamp code is printed, one rectangle to a line. Also, some statistics on graphs used to generate the rectangles are printed. Stuart Anderson's 'ssh.exe' (squared square hunter - finds SPSS, SISS, SPSR and SISR) - this binary was produced using an out of date object LEDA research library in 2001 and is no longer supported by the author. Due to the existence and availability of much faster software, with better capabilities on this website, and security objections to leaving downloadable executables on the site , ssh.exe has been removed from this webpage. A number of C,C++ programs have been written to assist in the cataloging, processing and analysis of square tilings. tc2bkp (tablecode to Bouwkampcode; S. Anderson) - Squared rectangles and squared squares are represented in a concise notation called Bouwkampcode. Bouwkampcode without the parentheses and commas is called tablecode. Tablecode is easier to work with in computer programs. It is possible to convert between the two formats. Converting Bouwkampcode to tablecode is trivial as it involves replacing parentheses and commas with whitespace, however converting the other way is not trivial and involves constructing the tiling geometrically and then placing the parentheses correctly, which is what tc2bkp does. The other utility programs operate on either Bouwkampcode or tablecode, but most produce output in tablecode, so if you require Bouwkampcode as the final product you will need this program to convert the tablecode. To use, type tc2bkp followed by the Bouwkampcode file. bk2ps (Bouwkampcode to postscript; S. Anderson) - converts Bouwkampcodes (or tablecodes) into postscript booklets. You have a choice of 1, 6, 12 or 20 tilings per page. While one can construct a tiling from Bouwkampcode by hand, it is convenient to let the computer produce the graphics. To use, just type the program name, you will be prompted for the number of tilings per page, and an input file. bc2latex (for converting Bouwkampcodes to LaTex) use Armin Singer's (see below) linux/unix bc2latex . Usage example ; cat spss.txt | ./bc2latex > latex.txt. tc2tex (for converting tablecode to LaTex) use Lorenz Milla's, (see below) linux/unix/Windows tc2tex . Usage example : tc2tex input.txt , Windows users can drag and drop the input text file onto tc2tex.exe, reads only the FIRST line from the text file and creates a LaTeX-file "squares.tex". bc2mp (for converting Bouwkampcodes to Metapost) use Armin Singer's linux/unix bc2mp (see below). Usage example ; cat spss.txt | ./bc2mp > metapost.txt. bk2all (Bouwkampcode to all; S. Anderson) - simple squared squares and squared rectangles can be oriented in 8 different ways, usually only one 'canonical' orientation is chosen (with the largest corner square at the top left, and the larger of the two squares adjacent to it on the top). If you want all 8 tablecodes of a particular dissection, use this program to generate them. This program will operate on compounds but does not produce compound isomers, only the whole tiling is reoriented, not any included smaller dissections (the 'trivial' isomers - not the compound isomers). To use, type the program name followed the Bouwkampcode filename. A dissection is either simple or compound. A simple dissection does not contain a smaller squared rectangle or squared square, while a compound dissection does. Determining if a dissection is square/rectangular or perfect/imperfect is easy to program and can be done as the dissections are generated. Determining if a dissection is simple or compound is not a trivial operation, although it is easy to spot the difference by eye, it not so easy to program a computer to do so, and to do it efficiently requires some ingenuity. In the theory of squared rectangles 3-connected planar graphs with a identified edge (c-nets) produce simple tilings, and 2-connected graphs produce compound tilings. This is generally true, but there are exceptions, it is possible for c-nets to produce compounds in rare circumstances. In the higher orders what is rare at lower orders becomes more frequent and a means of separating simples from compounds is necessary, particularly if one is interested in enumerating the exact number of tilings of each kind for a given order of tilings. bk2cpss (Bouwkampcode to CPSS; S Anderson) - If one substitutes a squared square into the elements of that or another squared square, and scales both so that all squares are integers, then a new squared square is the result. If this is applied to a Bouwkampcode (or tablecode) listing, and if any resulting imperfects are filtered out then a new collection of CPSSs is the result. Starting with a single PSS, an unlimited supply of CPSSs can be created by performing this operation iteratively. As the smallest PSS (21 : 112 AJD) has 21 squares, performing this operation creates a CPSS of order 41 (one square is lost to become the container for the included square, so these varieties of CPSS start at order 41. SISSs with a single imperfection can also be used to create CPSSs, these SISSs start at order 22. To use, type the program name, bk2cpss followed by a Bouwkampcode filename. bk2mb (Bouwkampcode to maximum square not on the boundary; S. Anderson) - If one looks at squared squares and squared rectangles it appears that the largest square is always in a corner. In fact there are rare exceptions, it is possible for the largest square not to touch the boundary of the tiling at all. This program searches Bouwkampcode/tablecode and finds those particular dissections. bk2sss (Bouwkampcode to squared squares squared; S. Anderson/Stijn Van Dongen) - If one takes a squared square, shrinks it and places copies inside each square of the squared square, then one can create a 'fractal' squared square. This program inputs Bouwkampcode/tablecode and uses postscript code 'sqile.ps' by Stijn Van Dongen to create 'fractal' squared squares in postscript. The postscript can be hand edited to change various parameters, such as reverse colouring and recursion level. Type the program name followed by the Bouwkampcode filename. bk2canon (Bouwkampcode to canonical tablecode; S. Anderson ) Converts Bouwkampcode to canonical Bouwkampcode (in tablecode form). A squared square or squared rectangle can be rotated and reflected in 8 ways. Each of the 8 ways has a different Bouwkampcode. One of those 8 codes is the canonical code of that tiling. For perfect squarings it is the code with the largest corner element in the top left square, and the larger of the 2 elements adjacent to it on it's right. For imperfect squarings the same rule applies but further elements of the 8 codes may need to be compared, element by element, the canonical code is the largest code lexicographically speaking, based on numerical comparison of corresponding elements in the canonical code. so the program(s) can be called from anywhere on the computer. All Stuart Anderson's programs are in the zip files; bkutil.zip . (compiled executables have been removed from the zip file, you will need to compile the sources yourself, for Windows the free MinGW is recommended), bkutil.zip has source code for Windows/Linux/Mac. Source code for Microsoft Visual C++ is no longer supplied, as this compiler required different timing code and executables compiled on WinXP would not run on Windows 7, whereas MinGW compiled executables run on both. Armin Singer's programs are in the squaredance package. If you are using Windows, the UnxUtils is a very good package of general unix/linux commandline utilities, converted to run as windows executables. Great for sorting and sifting data (like large collections of Bouwkampcode files). Armin Singer has produced squaredance to display squared squares as a slideshow along with his own collection of Bouwkampcode Utilities. Designed for Xwindows (linux, unix). On linux, "tar xzf squaredance-0.10.tgz" will unpack the package and put its files into a subdirectory named squaredance-0.10. Invoking "make" in this directory should produce the squaredance executable. You may need the xorg libraries and the symlinks, headers, and object files needed to compile and link programs which use the standard C library. In ubuntu these can be installed with sudo apt-get install xorg-dev libc6-dev . The squaredance package will show you simple perfect squared squares using XVideo. Most parts of it are taken form Open Source (xorg, tvtime). Only a few things have been added by asi AT equicon.de. There is no fancy GUI but just the things needed to enjoy the show. But there are some useful utilities to deal with lists of Bouwkamp Codes (suitable for both the table representation and the traditional form). tc2tex - written by Lorenz Milla, Germany - April 2012 - Version 1.0. Requires one argument: the name of the input text file. Windows users can drag and drop the input text file onto tc2tex.exe. Reads only the FIRST line from the text file, and only in this format. simptc2canon converts tablecodes to their canonical isomer, ignoring all substructures. comptc2all generates for most CPSS the whole CPSS class. comptc2canon converts most CPSS tablecodes to their canonical isomer. sortfile generates batch files for the sorting algorithm of Win32 CoreUtils. splitbyorder reads in tablecode or Bouwkampcode, splits into several files, depending on the order. There is a make file to compile with MinGW. simptc2canon, comptc2all, comptc2canon, sortfile and splitbyorder written by Lorenz Milla, Dossenheim, Germany, November 2013. // Similar to tc2tex, tc2ctex converts compound tablecode to LaTeX-files, also drawing a small picture of the substructures. // tc2ctex - compound tablecode to latex (works also with simple squared squares). // requires one argument: the inputfilename. // outputs one latex file per line from inputfilename. // latex-files have to be compiled latex => PS => PDF ! // feel free to modify! See Richard Parris 'peanut software homepage' for a range of maths programs and his windisc page for a copy of that software. 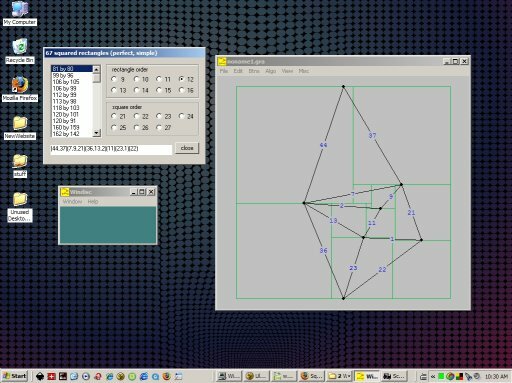 To use windisc to view squared rectangles and c-nets, start the program, select Windows -> graphs, then select File -> New -> Squared Rectangle. Some of the viewing parameters can be edited under View -> Squared Rectangles.